Full issue super special featuring...DRAVN! 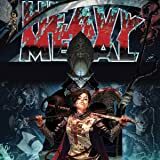 DRAVN, a new thing from filmmaker Jesse Negron debuting RIGHT NOW exclusively in the pages of Heavy Metal Magazine. 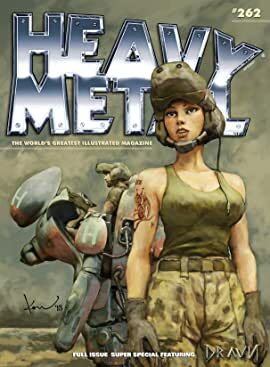 Here 'tis, a full-issue saga of inter-related tales where dizzying heights of storytelling mastery cross paths with unadulterated science-fantasy. What if super-powered heroes and villains have always existed, buried somewhere under our mythology and folklore? We're not talking about capes and tights, we're talking about the real demi-gods that walked and pounded the Earth! Created by filmmaker Jesse Negron (AMERICAN FIGHTER PILOT, POP & ME) and written by Negron with our old friend Dave Elliott (ATOMEKA, MONSTER MASSACRE), DRAVN features characters designed exclusively by Hollywood concept artist Keith Thompson (DON'T BE AFRAID OF THE DARK, PACIFIC RIM), and brought to life by artists from around the globe, including members of Imaginary Friends Studios and STELLAR Labs, to name a few.In this epic story, history and legend get a bit twisted with characters as diverse as Camelot knights and Romanian impalers and Nazi stormtroopers all getting connected by greater forces, as super-beings stand revealed as the decision-makers and the rest of humanity left struggling with the pieces of a cosmic gambit more screwy than a primetime news headline. 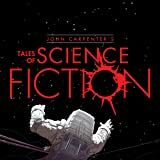 John Carpenter's Tales of Science Fiction is a brand new monthly anthology series from Storm King Comics. 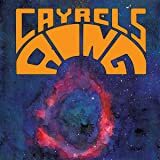 Cayrels Ring is a science fiction series influenced by 70's Euro comics and artists such as Moebius, among others. Each issue features short stories telling tales of inhabitants of the ringed galaxy known as Cayrels Ring.